This Resources document contains links to U.S., U.K, EU, Canadian, and Australian legal profession-AML resources, as well as links to FATF webpages and documents that include the FATF Mutual Evaluations page, the 2008 and 2019 FATF RBA for Legal Professionals, the US Voluntary Good Practices Guidance, and the IBA-ABA-CCBE Lawyer’s Guide to Detecting and Preventing Money Laundering. 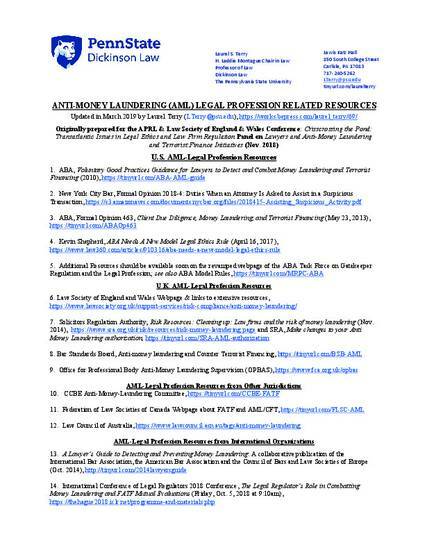 This “AML-Legal Profession Resources” document also includes links to law review Symposia about the FATF 40 Recommendations, and law review articles, presentation slides, a “two-pager” that summarizes the “red flags” listed in the Voluntary Good Practices Guidance document, and other materials by Laurel Terry related to the topic of the Financial Action Task Force (FATF), and anti-money laundering (AML) regulations that apply to lawyers and the legal profession. The author welcomes contact from scholars, regulators, and others who have similar interests. She is a faculty member at Penn State Dickinson Law in the United States.